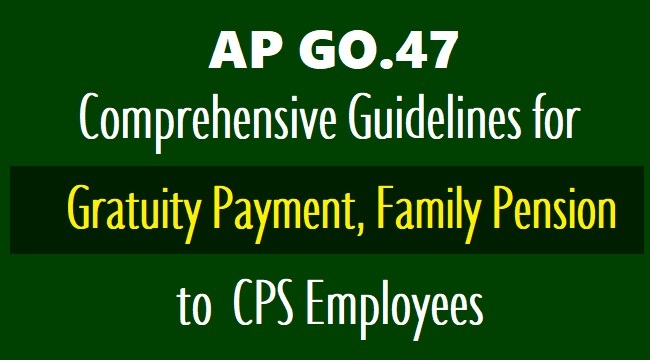 Comprehensive guidelines for Payment of Retirement /Death gratuity and Family pension to AP CPS Employees. 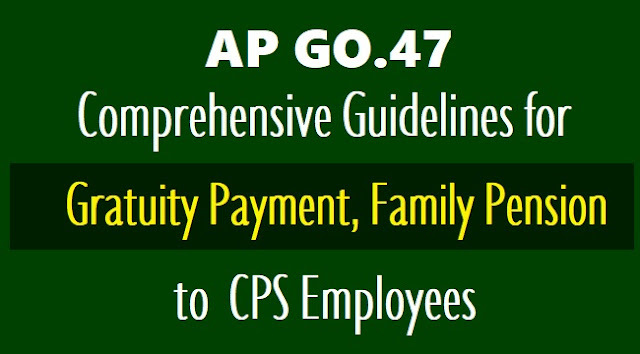 AP GO.47 for Contributory Pension Scheme Employees. GOVER NMENT OF ANDHRA PRADESH: Pensions – Contributory Pension Scheme (NPS) –Payment of Gratuity to the employees covered by CPS and invalidation pension & family pension at the option of the employee/ family members in case of premature exit due invalidation/death of the employee - Comprehensive guidelines - issued. 3. O.M. No.38/41/05, P&PW(A), dated 05.05.2009 of Ministry of Perso nnel Public Grievances & Pensio ns, Department of Pension and Pensioners Welfare. 6. The PFRDA Regulati ons dated 11.5.2015 on Exit and Withdrawals under the NPS Regulations, 2015. 7. O.M. No.7/5/2012, P&PW(F)/B, dated 26.08.2016 of Ministry of Per sonnel Public Grievances & Pensions, Department of Pension and Pensioner s Welfare. 8. No.28/03/2016-, P&P W(B), dated 10.01.2017 of Ministry of Personn el Public Grievances & Pensio ns, Department of Pension and Pensioners Welfare. 9. G.O.Ms No. 107, Finance (HR.V) Department, dated 29.06.2017. 10. G.O.Ms No. 121, Finance (HR.V) Department, dated 18.07.2017. 11. From A.P.JAC of Em ployees, Teachers,Workers and Retired Employ ees Associations Representation, dated 04.12.2017. 12. From Andhra Prades h Contributory Pension Scheme Employees Association(APCPSE A) Representation, dated. 15.02.2018. 2. In the reference fourth read above, instructions were issued extending the aforementioned benefit provisionally to the employees of State Government covered by Contributory Pension Scheme (NPS) in to, duly applying similar provisions of the A.P. Revised Pension Rules, 1980 with a condition to adjust the payments/relief made to the employees against the amount accumulated funds in CPS account, pending finalisation of the guidelines. However, while issuing order vide G.O. fifth read above, adopting exit policy and interim guidelines, the orders issued in the reference fourth read above were withdrawn, as a result of which the benefits of Retirement /Death gratuity and Family pension, extended as additional relief by the G.O.I. vide GO third above to its employees are not admissible to the similarly placed persons in the State Government service or their legal heirs.